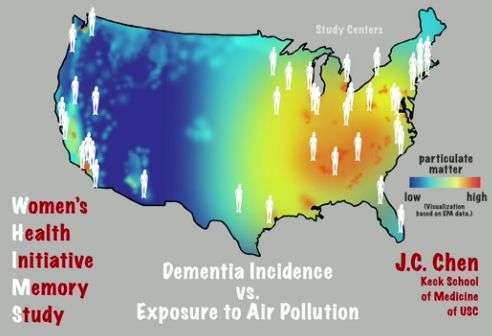 Tiny air pollution particles—the type that mainly comes from power plants and automobiles—may greatly increase the chance of dementia, including Alzheimer's disease, according to USC-led research. Scientists and engineers found that older women who live in places with fine particulate matter exceeding the U.S. Environmental Protection Agency's standard are 81 percent more at risk for global cognitive decline and 92 percent more likely to develop dementia, including Alzheimer's. "Microscopic particles generated by fossil fuels get into our body directly through the nose into the brain," said University Professor Caleb Finch at the USC Leonard Davis School of Gerontology and co-senior author of the study. "Cells in the brain treat these particles as invaders and react with inflammatory responses, which over the course of time, appear to exacerbate and promote Alzheimer's disease. "Although the link between air pollution and Alzheimer's disease is a new scientific frontier, we now have evidence that air pollution, like tobacco, is dangerous to the aging brain." The adverse effects were stronger in women who had the APOE4 gene, a genetic variation that increases the risk for Alzheimer's. "Our study—the first of its kind conducted in the U.S.—provides the inaugural scientific evidence of a critical Alzheimer's risk gene possibly interacting with air particles to accelerate brain aging," said Jiu-Chiuan Chen, co-senior author of the study and an associate professor of preventive medicine at the Keck School of Medicine of USC. "The experimental data showed that exposure of mice to air particles collected on the edge of USC damaged neurons in the hippocampus, the memory center that is vulnerable to both brain aging and Alzheimer's disease." Their study, published Jan. 31 in the Nature journal Translational Psychiatry, adds to an emerging body of research from around the world that links air pollution to dementia. The offending pollutants—known as PM2.5—are fine, inhalable particles with diameters 2.5 micrometers or smaller. A human hair is about 70 micrometers in diameter, making it 30 times larger than the largest PM2.5. The researchers analyzed data of 3,647 65- to 79-year-old women from the Women's Health Initiative Memory Study (WHIMS). These women lived across 48 states and did not have dementia when they enrolled. "Our state-of-the-art aerosol technologies, called particle concentrators, essentially take the air of a typical urban area and convert it to the air of a freeway or a heavily polluted city like Beijing," said Sioutas, co-author of the study. "We then use these samples to test exposure and assess adverse neuro-developmental or neuro-degenerative health effects." "Our study has global implications as pollution knows no borders," said Finch, holder of the ARCO/William F. Kieschnick Chair in the Neurobiology of Aging. "We analyzed data of high PM2.5 levels using standards the EPA set in 2012," Chen said. "We don't know whether the lower PM2.5 levels of recent years have provided a safe margin for older Americans, especially those at risk for dementia." "Many studies have suggested that early life adversities may carry into later life and affect brain aging," Chen said. "If this is true, then maybe long-term exposure to air pollution that starts a downward spiral of neurodegenerative change in the brain could begin much earlier and rev up in later life."